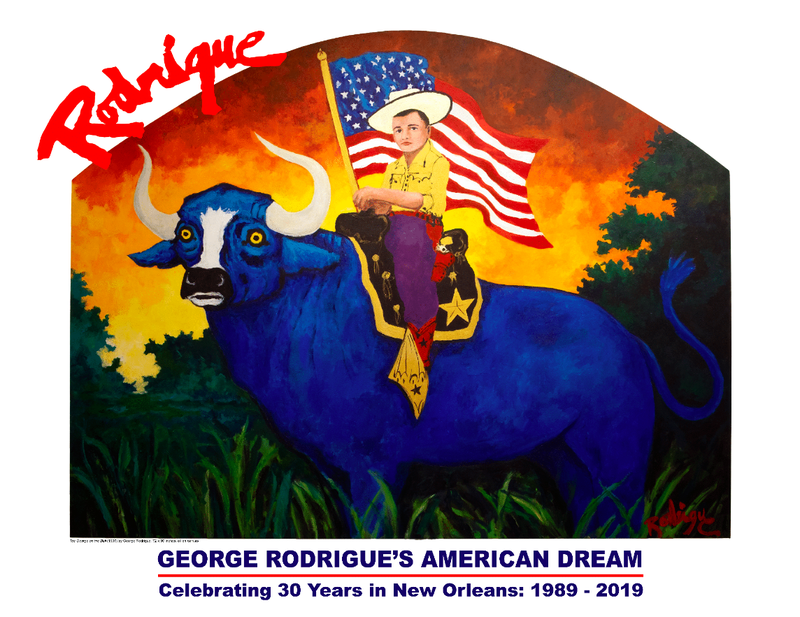 As the Rodrigue family celebrates their 30th year in New Orleans, Rodrigue Studios has assembled artwork that represents all genre and periods of George Rodrigue’s body of work, including Landscapes, Cajuns, Portraits, Hurricanes, Blue Dogs, Bodies, and late works on metal and chrome. Special projects and atypical works are also highlighted within this special commemorative exhibition, celebrating the life, art and achievement of George Rodrigue’s American Dream! 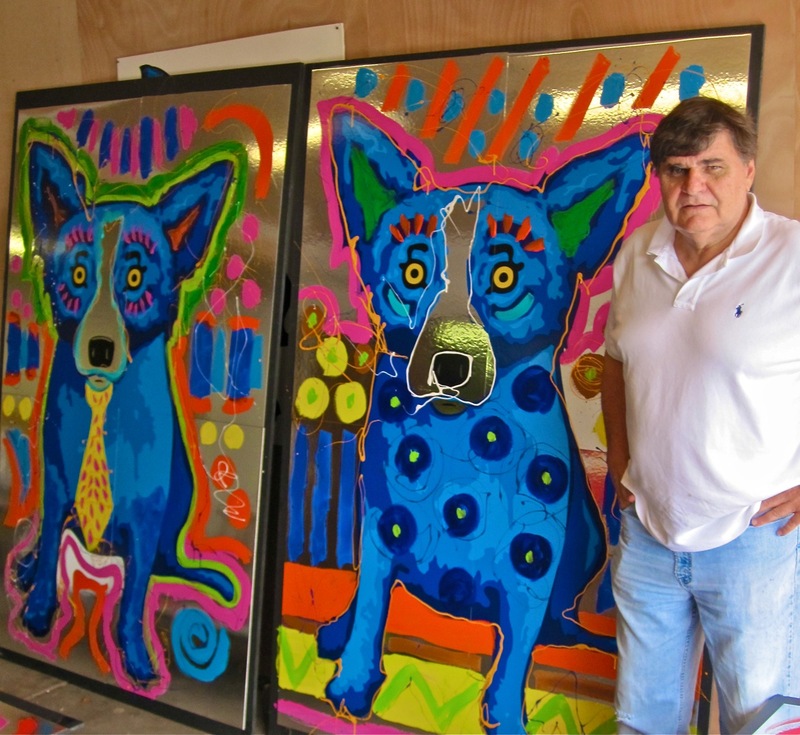 Located in the vicinity of Tulsa, Oklahoma, this museum will host the exhibition Shiny Happy Blue Dog, highlighting George Rodrigue’s painted artworks on metal. The installation of twenty original artworks marks the first-ever exhibition of the famous Blue Dog paintings in Oklahoma exhibition is in partnership with the George Rodrigue Foundation of the Arts on behalf of Louisiana A+ Schools and Oklahoma A+ Schools. On November 1, 2018, LSU Museum of Art will open an exhibition featuring early landscape paintings by Louisiana artist George Rodrigue (1944–2013). Rodrigue was born and raised in New Iberia, Louisiana, the heart of Cajun country. For more than four decades, Rodrigue sought to depict his Cajun heritage through his work. 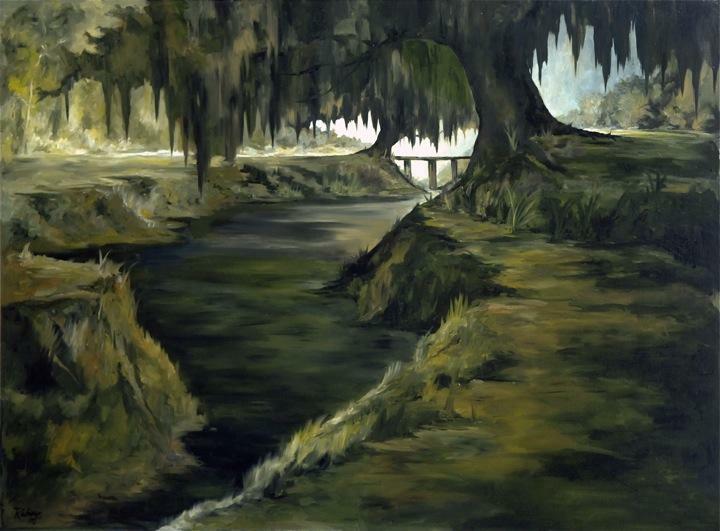 The oak tree was a primary feature inspiring many landscape paintings in the early 1970s, which evolved to include Cajun people and traditions, as well as his interpretations of myths such as Jolie Blonde and Evangeline. George Rodrigue (1944-2013) brought his Louisiana inspired art to Carmel-by-the-Sea in 1992 when he opened his first location known as Galerie Blue Dog. In 2000, Rodrigue and his wife Wendy made a home in the nearby hills. The quiet refuge enabled the artist to paint hundreds of paintings in his spacious, sun-drenched studio. While his roots remained in Louisiana, Carmel always held a special place in his heart. 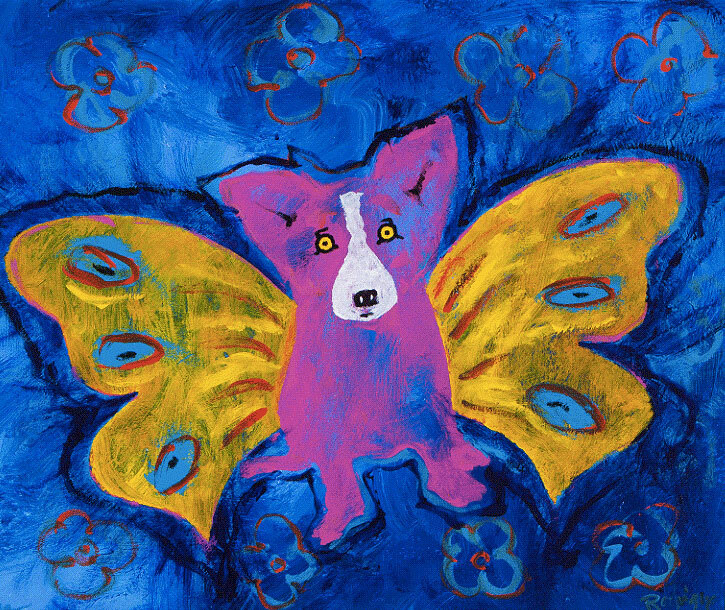 George Rodrigue made Lafayette his home for many years, inspiring many of his Cajun works. 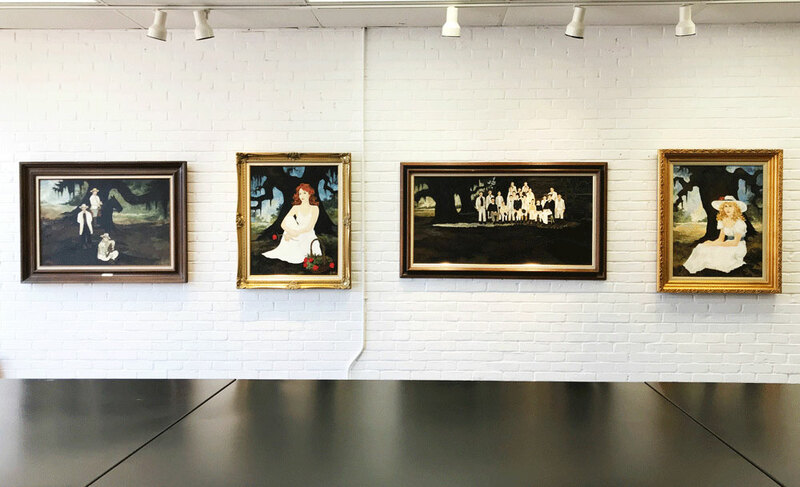 Now on view at Rodrigue Studio in Lafayette, is a stunning collection of available original paintings spanning 40 years. 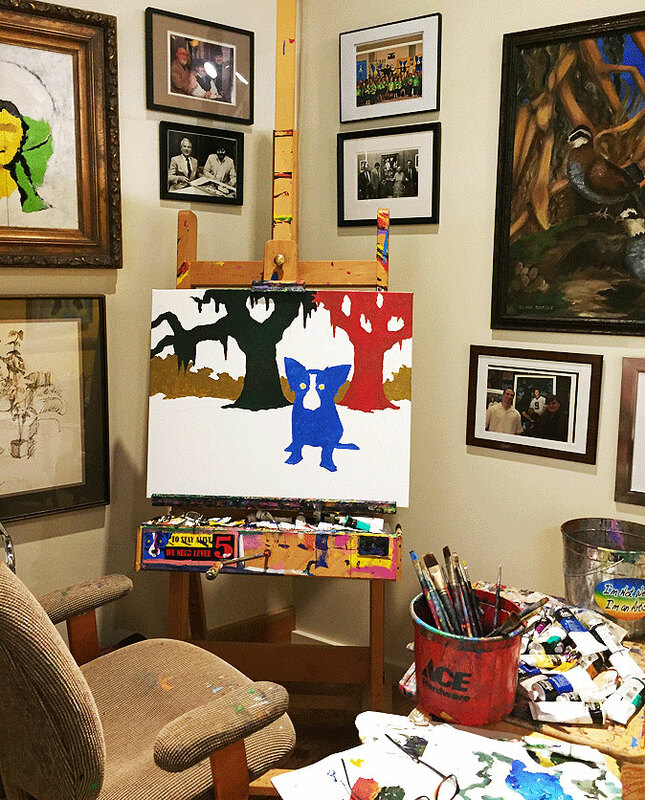 In January 2017, the Bayou Teche Museum unveiled a recreation of George Rodrigue’s Carmel, CA studio space, complete with the artist’s easel and unfinished painting, and the plywood floor, splattered with paint. Artifacts and memorabilia from his youth, including his Boy Scout days in New Iberia and early student work paintings from his private collection are included in the installation.